SUPERDEAL! Can GoreTex be affordable and attractive? Yes it is possible! Now on sale! Patron GoreTex jacket by Alpinestars. Don't wait too long, stock is limited. Buy this jacket now for only €399,95. Matching trousers? 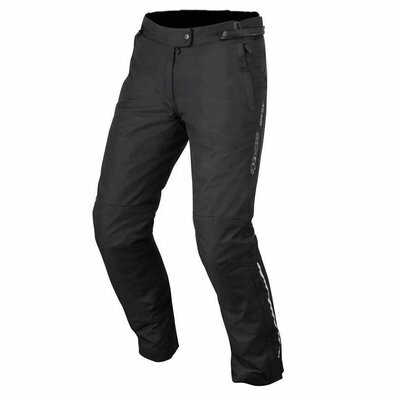 We now sell Patron GoreTex trousers for just €199,95. Prefer the complete set? Even more discount; € 569,95 for Patron GoreTex jacket AND pants. Please contact us for this and we will discuss the correct size and color and send you a payment link. The Adventure Touring Patron Jacket has excellent features and superior comfort features, such as a GORE-TEX® membrane and thermal lining and a front ventilation system for optimized internal airflow levels. This jacket can be perfectly combined with a range of textile touring trousers for the ultimate in versatility and comfort. Multi-panel head construction with reinforced shoulder and elbow areas for an optimal combination of durability, wear resistance and weight. GORE-TEX® head frame that is glued for weight saving, plus exceptional water resistance and breathability. Removable thermal jacket (100 g, body, 70 g, sleeves) with comfort edge and Velcro closure for attachment on the inside. Waterproof pockets on the front and an inside pocket for documents and a large handy storage compartment on the back for safe and easy storage. Waterproof zipper over the garment for guaranteed dry storage. Innovative ventilation system with large air inlets with zipper on the chest, an extended air outlet at the rear and ventilation openings on the upper arms provide superior internal cooling that, when working together, provides unrivaled airflow and prevents the build-up of potentially tiring heat. Stretch inserts in accordion textile on the elbows for improved fit and comfort and to reduce fatigue. Adjustable hip belt offers extra support and personal fit while the protection stays in place. Protection against impact provided by lightweight, removable and replaceable CE-certified elbow and shoulder protectors. Breast and back cushion compartments with PE filling (Alpinestars CE-certified Nucleon back and chest protectors available as accessory upgrade). Innovative hi-vis bracelet can be stored in the sleeve pocket, plus reflective details on the front and back enhance the driver's vision. Soft inner lining of the collar with padded edges to improve comfort. Internal waist connection zipper for attaching to a wide range of Alpinestars touring trousers for textiles.